Near the windup of our visit to southern California, we took a walk along the beach in Santa Barbara. Not far from our host’s house, we stood for a long time admiring the ocean and the sky’s patches of blue expanding and contracting as the weather tried to make up its mind. In the third year of a drought, people were hoping for rain. They got sprinkles. 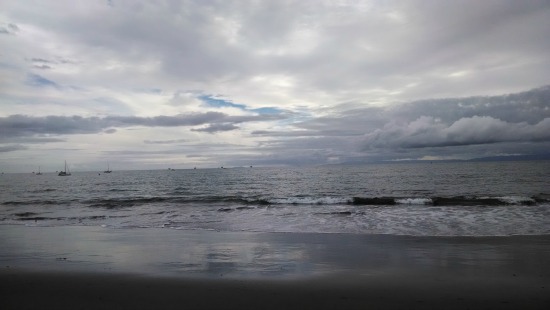 Those dots on the far horizon near the middle of the photograph are oil rigs. Santa Barbara is a magnet for tourists and travelers. 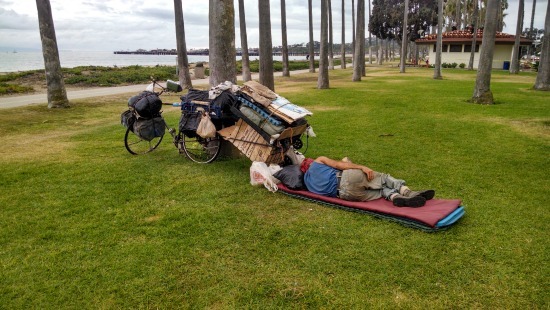 The streets and parks attract homeless people. Some of them extend their temporary residencies to weeks or months. The city seems hospitable to them or tolerant of them, at least. This man was lying on his side reading a book when we first saw him. Walking back, I saw that he had gone to sleep and waited a while in hopes that he was only snoozing. I’d like to have learned where he’d been on that loaded bicycle, pulling that loaded trailer, and where he was going. He slept on. We had a dinner appointment to keep. I’ve been thinking about him and imagining what his life must be like.